This multi-phased (two GMPs) project consisted of wet utility improvements in and around the Fiesta Tech business center. All work required extensive business and residential coordination to minimize impacts. GMP 1: Achen-Gardner installed 3,481 LF of new DIP and C900 water lines (12”) and eight valves (12”) on Arizona Avenue south of Baseline Road. We also tied in water services to existing meters and replaced 689 SF of stamped concrete. GMP 2: Achen-Gardner installed 10,816 LF of 6” force main including 1,462 LF of fused HDPE, 140 LF of dual 6” force main was jack and bored under the UPRR, 367 LF of new 12” DIP water lines, and a new 0.56 MGD lift station. The lift station work included an 8’ wet well, 8’ valve vault, dual Flygt 20 horsepower pumps, plug valves, check valves, stainless steel pipe and fittings, pump control panel, 480V electrical panelboard, 120/240V transformer and panel, antenna and mast, RTU, ARV, and lighting, conduit, switches, and receptacles. 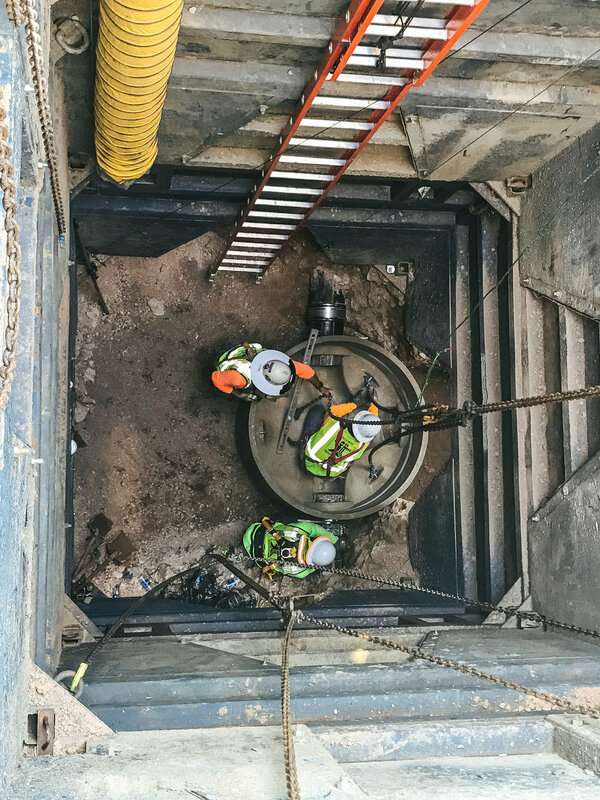 We also tied into existing sewer and water services for local businesses and installed 1,982 LF of (12”) gravity sewer including 1,468 LF that was fused HDPE directional drilled under Baseline Road from Arizona Avenue to Fiesta Boulevard.